An old-fashioned combination but so delicious. The crêpes do need to be thin. Warm butter, salt and milk until butter has melted. Put flour into a basin and make a well in flour. Break eggs into well and work in some flour. Add warm milk mixture and whisk until smooth. Refrigerate for 2 hours before cooking. The consistency should be like thin cream. If not, thin with more milk. Heat frying pan (preferably one designed for cooking pancakes). Wipe pan with a piece of buttered paper for the first pancake. Lift pan from heat, then ladle in batter and swirl to spread it to edges of pan. Set pan back over heat. After 1 minute, lift thin outer edge of pancake with a fine spatula and flip pancake using your fingers or spatula. When cooked, transfer to a plate in a low oven to keep warm. Repeat process. You will get better – and so will the pancakes! In a food processor, blend the grated zest of 2 oranges, about ½ cup castor sugar and 200g softened unsalted butter until pale, then incorporate the juice of the oranges and a shot (45 ml) of Cointreau. 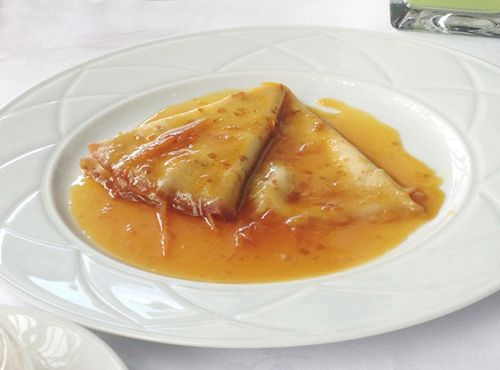 Spread cooked Crêpes with some of the orange butter, then fold each crêpe in half twice. Heat the remaining orange butter in a non-stick pan until bubbling, then put in the folded crêpes and heat them through, turning once. Flame with a mixture of Cognac and Cointreau, and serve.